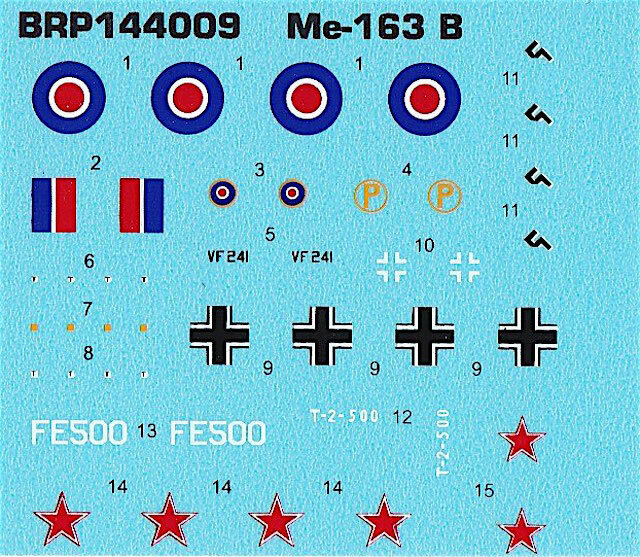 Contains parts for two complete kits, including 26 grey plastic parts; 2 clear plastic parts; 1 decal sheet with markings for 3 aircraft; 1 page black-and-white fold-out instruction sheet. Interesting subject, particularly in this scale; well moulded; interesting marking options. Brengun’s 1/144 Me 163 kits build up into small but well formed replicas of this unique fighter. While the “War Prizes” boxing has some minor idiosyncracies, these should not deter you from considering it as a quick project that will nonetheless pleasantly stretch your modelling skills. Technologically revolutionary but militarily insignificant, the Messerschmitt Me 163 Komet has long been a favourite of scale modellers. Several dozen kits have been produced over the years, in scales from 1/700 to 1/24. 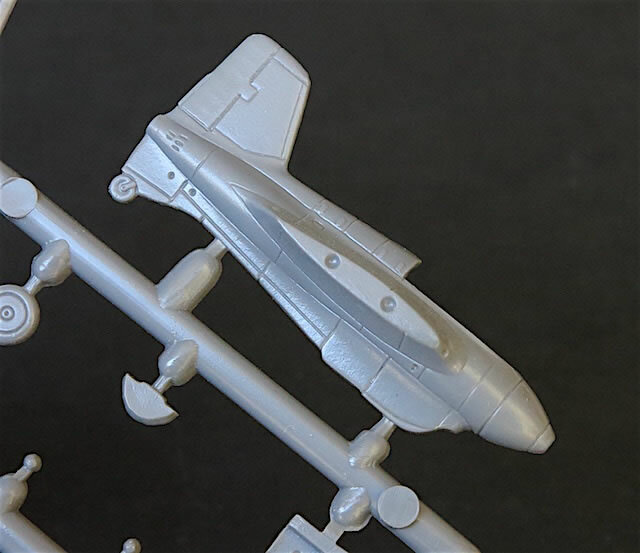 The Komet’s small size makes for a tiny 1/144 model, which is the scale in which Brengun has chosen to kit the type. 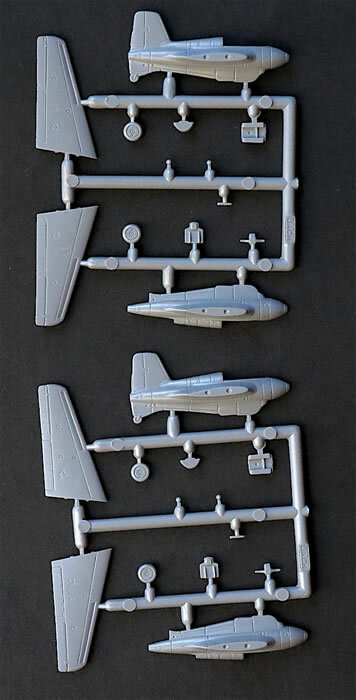 Brengun has so far released two versions of its Me 163 B kit – one in 2017 with Luftwaffe markings, and a later “War Prizes” boxing that I’m looking at here. Each contains parts for two models, which I suspect (without having had the opportunity to examine the Luftwaffe kit) are identical apart from the decals. The “War Prizes” kit arrives in a small (1.5 x 10.15cm, or approximately 6 x 4 inch) end-opening box. On the front of the box is a reasonable illustration of one of the subject aircraft (VF241 in RAF markings) while the back of the box is a painting and marking guide with four-view illustrations of all three subjects. On opening the box I was immediately struck by how small the Me 163 is in this scale. The fuselage is just over 3.5cm (1 ½ inches) long, with each wing slightly shorter than this. The photos of these parts next to my thumb, and the taped-together airframe in my palm, give some idea of what we are dealing with here! Each model consists of just 13 parts. This includes an instrument panel and cockpit tub/bulkhead with inbuilt seat. Not much of this will be seen through the clear but (perhaps inevitable in this scale) slightly thick canopy. 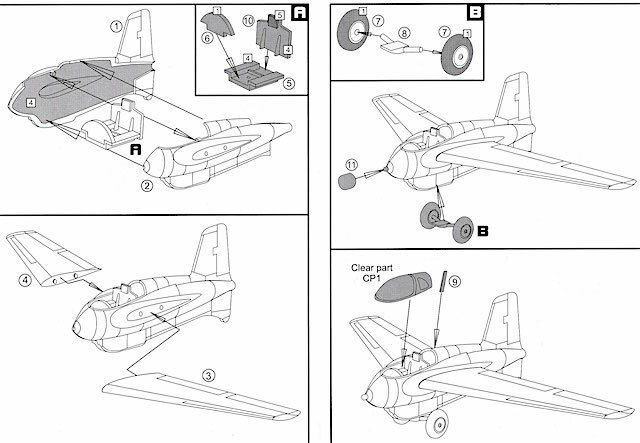 The tub is sandwiched between the fuselage halves, to which the wings are added and there is your airframe. Add the wheels on their dolly and a couple of smaller detail parts, and the model is finished. At face value, this looks like a kit you could build in an evening. In practice it’s not quite that straightforward. I’ve started construction, and my big take away is that you absolutely have to take your time. No pun intended, but the biggest challenge is the small size of the parts – you need to pay close attention to everything you’re doing. 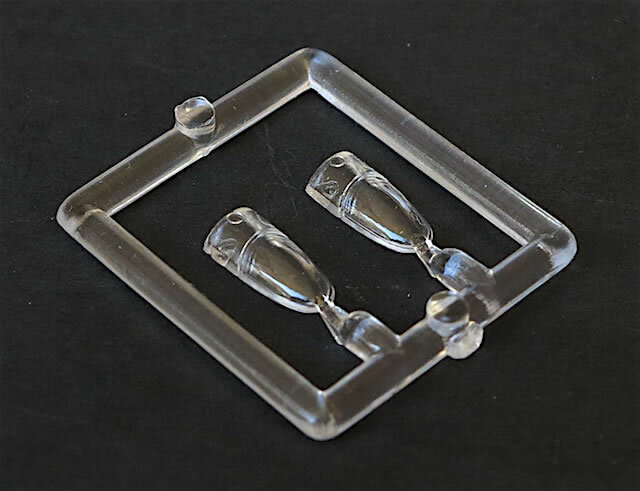 This includes when cleaning up the parts to make sure you’re not removing too much plastic; when gluing them together to avoid flooding tiny mating surfaces with glue; and above all when handling the bits to ensure they don’t ping off into oblivion. There are some limited-run characteristics to the parts. Fit of the cockpit tub inside the fuselage is a little vague, so you’ll need to test fit for alignment. The vertical fin is cast integrally with one fuselage half, which makes sense, but there is a join where this meets the other fuselage half that will need to be carefully filled. And while there are some small moulded nubs to assist with the wing/fuselage join, I’d strong recommend reinforcing these with wire or plastic rod to ensure a strong bond and to help with alignment. I don’t have a set of Me 163 scale plans but the shape and detail of the major airframe parts matches closely with the period photos in my main reference, Valiant Wings’ Airframe Album 10 on the Komet, with two possible exceptions. First, I don’t think Brengun has quite captured the rotund, almost bulbous shape of the fuselage forward of the wings and beneath the cockpit; when you compare it with photos of the real thing, the fuselage looks a little ‘thin’ in this area. Secondly, Brengun has depicted what appears to be a ‘fabric effect’ on the control surfaces, which isn’t correct. Fortunately this problem can be fixed with a few seconds’ sanding and polishing. The first is less easily addressed, but it’s by no means a showstopper. The instructions are printed in black and white on a small fold out sheet. 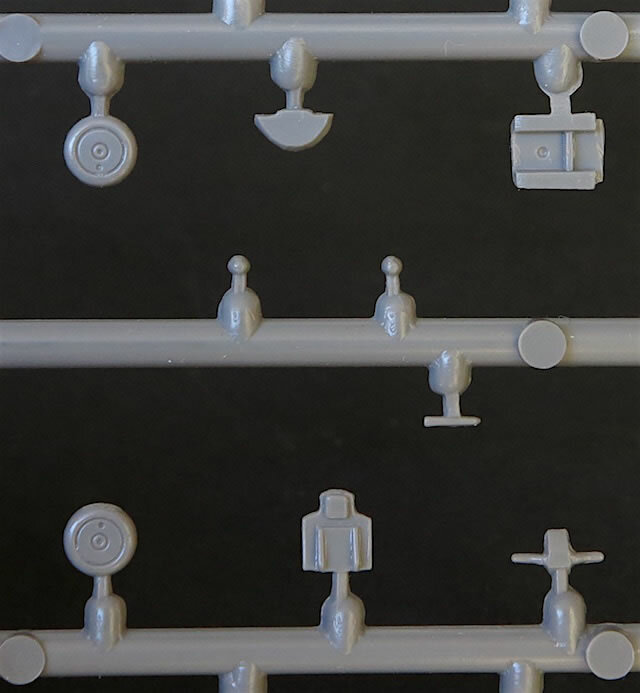 This contains four clearly illustrated assembly steps along with a small sprue map. As previously mentioned, the painting and marking guide is on the back of the box. Given the limited space available, the guide does a good job in providing four view drawings of each subject. These are in full colour, although the small size of the illustrations doesn’t convey the full complexity of the paint schemes – more on this below. The small decal sheet is well printed, with good colour demarcations and no misregistration or bleeding. My only criticism is that the decals aren’t positioned centrally on the sheet, with the result that some of the Russian markings are very close to one of the edges – it doesn’t look like the decals have been damaged, but their position on the sheet makes them more vulnerable than would normally be the case. Me 163 B-1, VF241 (W.Nr. unknown), captured and tested in the United Kingdom post-war. Airframe Album 10 lists this as the first Me 163 B captured by the British. As such it was extensively tested (in unpowered flight only) between 1945 and 1947, until damaged beyond repair when landing and subsequently scrapped. The upper fuselage of this aircraft was left in its original Luftwaffe camouflage. 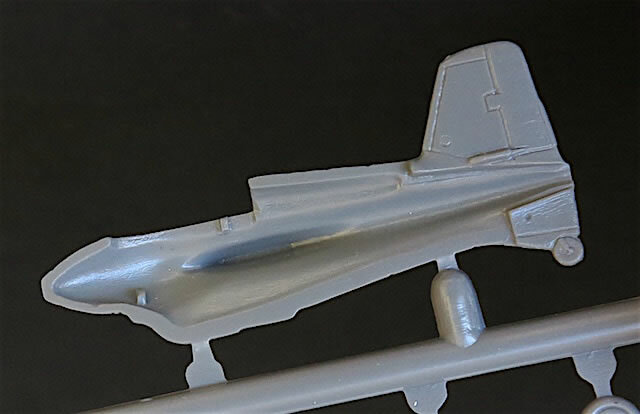 Brengun suggests RLM 76 Light Blue with RLM 75 Grey Violet mottling, while Airframe Album 10 recommends RLM 76 with RLM 81 Brown Violet and RLM 82 Light Green. Whatever the colours, Brengun’s marking illustrations don’t show the extent of mottling on the upper fuselage, so I’d look for reference photos rather than going off the kit instructions. 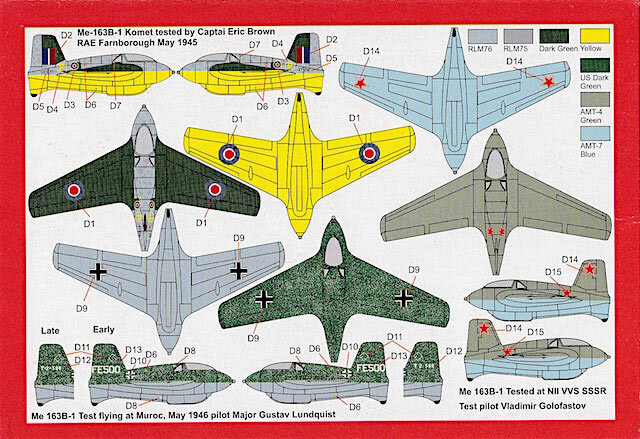 The remainder of the (British-applied) paint scheme of Dark Green fin and upper wings, and Trainer Yellow undersurfaces, is accurately captured in Brengun’s illustrations. Me 163 B-1, FE500/T2-500/W.Nr.191301. This machine is currently held by the Smithsonian Institute and is one of several Me 163s passed by the British to the US after capture. The cited camouflage is US Dark Green upper surfaces with RLM 76 mottling over RLM 76 undersurfaces. However I haven’t found any photos that clearly back this interpretation, so if you are considering this scheme I would check your references. Me 163 B-1, W.Nr unknown. This was one of several B-1s captured by the Soviets and tested in unpowered flight, before likely being scrapped some time in the 1950s. According to Brengun it was camouflaged in AMT-4 Green over AMT-7 Blue. Brengun’s 1/144 Me 163 kits build up into small but well formed replicas of this unique fighter. 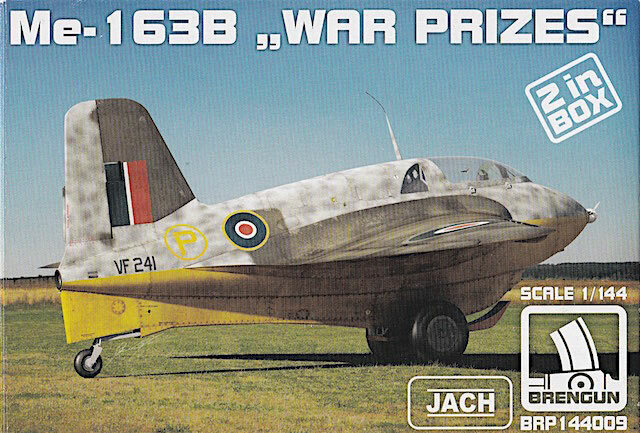 While the “War Prizes” boxing has some minor idiosyncracies, these should not deter you from considering it as a quick project that will nonetheless stretch your modelling skills. 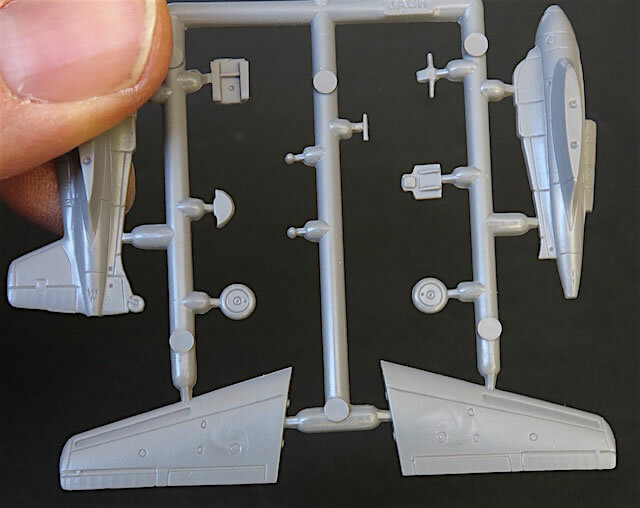 The tiny size of most of the parts demands attention during construction, and the mottled UK and US marking options will be interesting to paint. I’m looking forward to bringing my finished models to our next club meeting – I think their combination of subject and scale will attract plenty of attention!